With over 50 different surgical procedures in the literature relating to bunion surgery, there is a great deal of debate as to the best surgical procedure. Some consider a minimum incision technique to be ideal while others believe an open and more extensive correction is the best. For years, I have pondered the best surgical procedure for hallux valgus correction and have tried many of the procedures. I have come to some conclusions that have dramatically changed my practice and resulted in far better outcomes related to hallux valgus correction. First and foremost, I have to state that these are just my ideas. 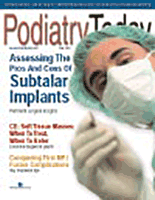 Hopefully, this article will educate others on my thoughts and my years of dealing with hallux valgus correction. As a resident in Pittsburgh, I had the opportunity to deal with multiple surgeons and experience all different forms of bunion surgery from the most complex reconstructions with several bone cuts to the minimal incision techniques. However, I found on a consistent basis that two or three doctors had excellent results without one hallux valgus procedure as the ideal choice. After I began practice in Los Angeles, I went through a period trying what I thought were the best surgical options and have come to realize that I am really comfortable with only two hallux valgus surgical options. What Advantages Does The Lapidus Procedure Offer? The Lapidus procedure allows for all levels of correction with no need to cut corners. There is minimal difficulty to the procedure and the learning curve was far easier for me than learning a closing base wedge. I am able to correct the intermetatarsal angle, reduce laxity, plantarflex the ray and even correct a small amount of proximal articular set angle by wedging the base slightly. Although there is a small amount of risk of nonunion with the procedure, if one uses the proper technique and the patient is compliant, the risk is very low. Finally, if one considers the entire foot as a whole, the Lapidus procedure is excellent for stabilization of the medial column of the foot, which prevents arch collapse, midfoot arthritis, posterior tibial tendon tear and possibly plantar fasciitis. From a consultation visit, I gather some key information to consider prior to surgery. How old is the patient and how active is the patient? Can this patient take time off for a comprehensive surgery and be off his or her foot for an extended time? Does this patient worry about the possibility of need for further surgery? In the physical exam, I check for tightness of the Achilles complex, the position of the foot while standing and the position of the arch both seated and weightbearing. I will also check for callus formation in two regions. The first is the medial great toe and metatarsal head while the second region is plantar to the second metatarsal head. Then I consider the hallux valgus deformity. The most important factor to me is how loose the first ray is. We discuss the intermetatarsal angle, the proximal articular set angle, the hallux abductus angle and the sesamoid position but I have found that dealing with laxity of the first ray is the single most important factor in my hands for a good outcome. Laxity of the ray is divided into two planes. I believe that the most important plane to consider is not the medial shift of the ray but rather the dorsal shift of the ray. Although I learned that equal dorsal and plantar motion are normal, if there is keratoma formation below the second ray and excess dorsal motion of the first ray, I feel there is laxity. In regard to medial laxity, I feel this is less of an issue as one can shift the ray laterally, increase the medial to lateral stability and decrease the potential for medial re-shift, but the ray can still be lax in a plantar to dorsal motion. Following the exam, I talk to the patient about his or her expectations, lifestyle, age-related recurrence issues and if he or she would consider a second surgery in the future if the hallux valgus deformity returns. In the case of an adolescent patient with hallux valgus deformity, I am very inflexible. One must close the growth plate of the first ray and a Lapidus procedure is the only option I will consider. In order to have a hallux valgus deformity at such a young age, laxity must be present. This is not shoe related and has clearly not occurred from years of walking. I also will consider a potential gastrocnemius recession and rearfoot alignment correction as needed. I feel that the younger the patient, the more the need there is for foot correction as opposed to pursuing hallux valgus correction only. When treating patients over the age of 75, I will often consider a distal head osteotomy for correction. In an older patient, the result may not be ideal with perfect stability but I feel there will be an early return to ambulation. The limited downtime and risk are substantial and important considerations. The majority of patients I see — and I believe the majority of patients whom most foot and ankle surgeons see — are between the ages of 25 and 65. This group requires the most care and consideration of a surgical procedure. I will consider a distal head procedure if a patient has a mild to moderate hallux valgus deformity with no gross laxity, if the patient cannot take time off work, has young children and cannot be non-weightbearing. I will also consider the procedure if the patient has health issues preventing a more comprehensive surgery or has little risk tolerance for an extensive surgery, and is willing to consider potential future surgery. I have found that an offset V procedure with two screws can correct almost all levels of mild to moderate deformity depending on the length of the dorsal arm. I also have found little risk with the surgery and excellent outcomes. Before surgery, I warn patients about the potential for recurrence and the fact that the correction may not last a lifetime in those with moderate laxity. I also offer a more comprehensive surgery but discuss the fact that it may not fit with their lives at this time. Finally, I discuss waiting until a better time for a more comprehensive surgery if I feel a Lapidus procedure is the best option. I give the patient the choice and provide a great deal of guidance. In the group with minimal health or lifestyle issues, no matter what the extent of the hallux valgus deformity is, I explain the fact that the true site of deformity and the cause of the hallux valgus problem is at the first metatarsocuneiform joint (MCJ). The bone does not bend midshaft and that laxity of the first MCJ is the major cause of the problem. It is fairly rare for me to find a hallux valgus deformity that is not lax in nature and has limited dorsal motion. I am a big proponent of the Lapidus procedure in all but the most stable of feet. If I feel the patient’s foot is amenable to osteotomy correction, I will discuss this option. However, if I feel the Lapidus is the only true option, I will discuss that procedure in detail and only mention the osteotomy in passing for the sake of completeness. I believe surgeons should guide patients in the proper direction and only offer the choices that fit their needs. When it comes to the Lapidus, I use a two-incision approach. I start with an incision over the midfoot and place it directly over the first MCJ. I use a distractor to access the joint and prefer the Weinraub retractor with 0.062 K-wires in the metatarsal and cuneiform to allow for a spread of the joint. With over 300 Lapidus procedures under my belt, I am fairly confident the procedure of choice for joint preparation is to remove all articular cartilage without a bone cut and then fenestrate the subchondral bone with a 0.062 K-wire or 1-mm drill bit under lavage. I open the first MPJ with a medial incision. Then I perform a medial and lateral sesamoid release, and a lateral intracapsular release only if needed. I also transect the extensor hallucis brevis tendon at the proximal incision. I position the first MPJ and MCJ under fluoroscopic guidance and temporarily fixate with K-wires out of the cannulated screw set of choice. I prefer the DePuy 4.0 cannulated sets as they have small profile heads and are made of titanium. You should place one screw from the metatarsal to the cuneiform and aim it at the navicular tuberosity. You will be surprised that the screw will be central in the bone if you are aiming at the navicular. The second screw goes from the cuneiform into the metatarsal base. You should look at a medial oblique view to make sure this screw is not long. Clinicians should usually emphasize casting and non-weightbearing for five to six weeks until fusion occurs. Make sure patients protect the foot for an additional two to three weeks in a boot prior to normal walking. I have experienced enough surgery and revision cases that I have a fairly good understanding of the surgical techniques and what works and what does not. I can say without reservation that minimal incision surgery does not have a consistent outcome and has a fairly high level of complication. I can also say implants in the great toe joint do not work well. However, foot and ankle stabilization procedures are very successful with minimal long-term problems if done well. I have performed a large number of first metatarsophalangeal fusions for arthritis of the great toe joint and I have very few, if any, patients who complain following this surgery. As long as one explains the reasoning of the surgery and why it is best for the patient, patients will often understand and follow the surgeon’s lead. This is not to say that I do not have patients leave my office after I suggest a Lapidus procedure and have minimal incision surgery elsewhere. However, I have found some of the patients who leave are looking for a quick fix without future consideration. My comfort level is having near perfect outcomes on every case I take on in this area. Therefore, I will not compromise my result just to do a case. I suggest to those new in practice to consider this fact and perform surgeries they are comfortable with and feel strongly will lead to excellent outcomes. Granted, with this approach, one may not handle every hallux valgus case but the ones the surgeon does will turn out well and will lead to more referrals compared to those that turn out poorly and lead to a bad reputation. Remember, a patient mentions a good outcome five times but mentions a bad outcome 100 times. Dr. Baravarian is Co-Director of the Foot and Ankle Institute of Santa Monica. He is an Associate Professor at UCLA Medical Center and is the Chief of Podiatric Surgery at Santa Monica/UCLA Medical Center.